I did it! I wrote every day in the month of March!!! My manuscript is at 40,108 words. I'm in chapter 35 of 50! My first draft is 70% done! I'm not sure how much I wrote this month, but I think it was around 16,000 to 17,000 words. It looks like I started around chapter 21 and from there the word count in my manuscript is almost 17,000. What I can tell you is it was the best writing experience I've had so far. Not as exciting as a 6,000+ word day I had during one NaNoWriMo, but a really great method I want to continue for the rest of my life. It's simple: write every day. That's it. It doesn't matter how many words, or for how long, but you write every day. It kept my mind in the story so every time I sat down to write, even if it was for five minutes, I could crank out the words and add more to my story. I still didn't write a ton this month considering I wrote every day, but it was a whole lot more than I would have written using my normal technique. Wait until I have a decent chuck of free time and write for a large chunk. The problem is that those times usually come only a few times a month. So I never wrote consistently. 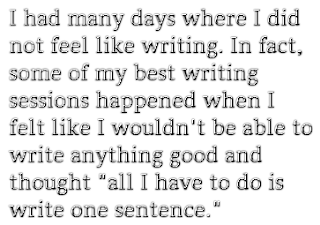 Now that I've experienced writing every day, I never want to go back. So this month of April I will write every day again, AND track my word count. I should have a spiffy graph at the end of the month. Then you will see I'm not doing anything special. My biggest days were only 1,000 - 2,000 words, but a lot of days I only wrote a couple hundred words. In conclusion, I'm really glad I decided to make this challenge for myself. Part of the inspiration was a story about someone who decided to just do 5 pushups every time they brushed their teeth. 5 pushups was an easily attainable goal that they knew they could do every time. They almost always ended up doing way more than 5 pushups, but with that as the goal they always did them. I had many days where I did not feel like writing. 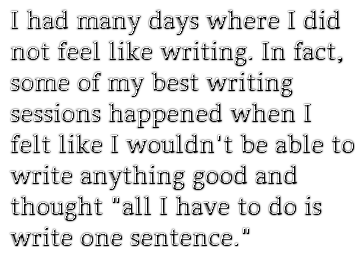 In fact, some of my best writing sessions happened when I felt like I wouldn't be able to write anything good and thought "all I have to do is write one sentence." Knowing I could do that I would get started writing. The great thing I discovered this month? Once you start you always just keep going! My days with really small word counts were just days where I only had a small amount of time to jot down several paragraphs. The other inspiration was from Jerry Seinfeld of all people. He's a super productive dude. 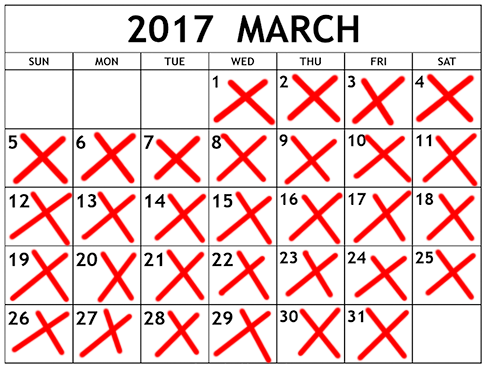 He takes a calendar and every time he has a day where he wrote jokes he puts a red X on it. Then he marks a red X on the next day and it looks like a chain. Then he says "Don't break the chain." You can read about it in this Lifehacker article. I think having daily word counts to hit deadlines is a smart awesome thing. For me right now, however, with my family of 6 and full time day job - I will keep writing everyday. No matter how many words I get down, I will write every day. And the words will keep piling up! Thanks for going on this journey with me!